How did I get that fun green glitter accent you ask? I found this awesome tape at the craft store! It's CLEAR mounting tape. It's as strong as the foam mounting tape, but clear instead! To make the card I cut a overhead transparency in half, cut a piece of white cardstock slightly smaller, and ran the paper through the Cuttlebug to give it a little dotted texture. Isn't it cute! 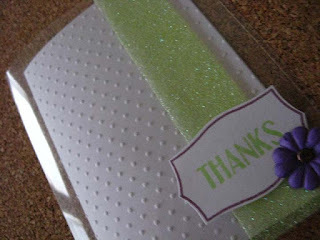 Then, just run a stripe of the clear tape up the front of the card, sprinkle on glitter, and your glitter border is done. It's that simple. 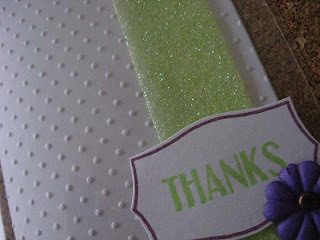 Stamp the border and "Thanks" sentiment from the Borders and Corners stamp set, cut out, adhere, and you're done! I LOVE how the glitter has a transparent feel to it, since it's adhered to a clear backing! Happy Crafting! I've got another quick Halloween project for Tutorial Tuesday! See you then!